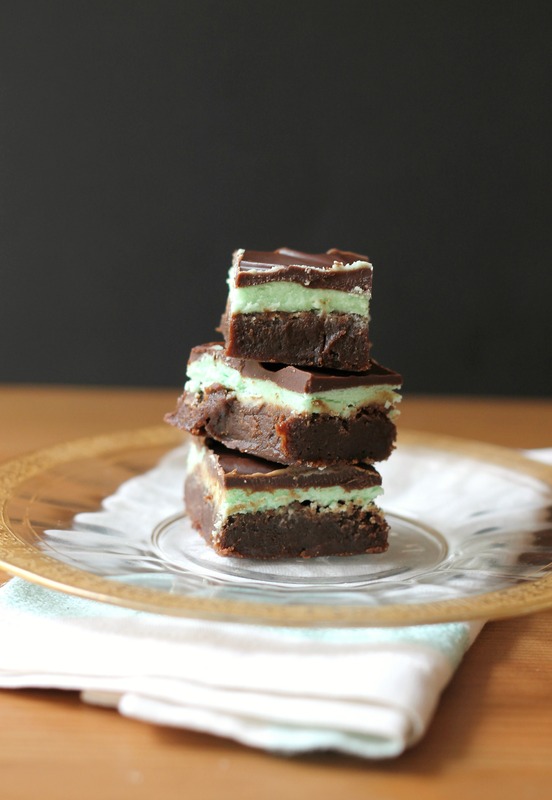 These brownies are possibly the best you will ever eat, unless you have an ardent hatred for mint! The ganache and the mint frosting (or “mint ice cream,” according to our 7-year-old little brother. We didn’t correct him because it was too funny!) make an almost melt-in-your-mouth topping for the fudgy brownie underneath. Basically, these brownies are almost like eating squares of candy. They are that good! Our whole family loved them and we cannot wait for a good excuse to make them again sometime! Preheat oven to 350 degrees. Line a 9×13 inch pan with foil and grease it. Melt butter and chocolate together in a medium-sized pot. Stir in sugar. Blend in eggs and vanilla. Add flour and mix well. Pour in prepared pan. Bake 30-35 minutes or until a toothpick inserted into the center comes out with fudgy crumbs (don’t overbake!). Cool for a few minutes, then place in the freezer for 20 minutes. In a medium bowl, beat together the butter, milk, powdered sugar, peppermint extract, and food coloring if using. Spread over the brownies evenly and place back in the freezer for 20 minutes. Melt the butter and chocolate and whisk together. Pour the ganache over the top of the brownies and use a spatula to spread it evenly over them. Freeze for another 20 minutes, then slice in 24 pieces. Serve. Enjoy!